The case is made from leather, and the inside is a suede-type material. The one I’m using is black with a green interior, with matching interior and exterior stitching. The leather on the outside has a diamond pattern and a sheen to it. It’s available in other colours – I’ve also got a red one here, but it looks a bit handbaggy for my taste. The iPad is held in place with four leather clasps. However, only half of the iPad is secured with the clasps, leaving the bottom half of the iPad to swing out and slot into one of two grooves. This gives you a solid base, and viewing angles of about 41 and 60 degrees. You can also slide the iPad down to rest on the front cover’s large clasp (which keep the case closed), giving you a another position to work with, of about 20 degrees. If you want, you can slide the iPad back beyond the second groove, to give a higher viewing angle, but you’d better ensure it’s on a stable surface or it’s likely to fall over. Finally, you can flip the case over to provide an almost-flat angle (about 5 degrees). The two grooves give the case stability, and these main viewing angles are really comfortable. It’s easy to sit down and start typing, as I am now, and also very easy to use in bed – the fact that the case is quite sturdy and forms its own base adds to the usefulness. The iPad’s ports are all exposed, and the case doesn’t get in the way of accessing them. The only problem I’ve had is in attaching Apple’s component cable; there doesn’t seem to be quite enough space to allow it to comfortably remain seated in the dock. Regular dock cables aren’t a problem and fit snugly. I really like the profile of this case. It allows to me to use the iPad in a comfortable typing position, but still remains svelte. It adds only a little to the iPad’s dimensions, especially compared to Proporta’s book-ish recycled leather case. Dimensions of the iPad plus case are 196mm across, 18mm thick and 244mm high. The downside to this case is that it’s not ideal in portrait mode. If you want to use your iPad like a book, then you have to fold the cover back around itself, which leaves a gap between the iPad and the back cover. 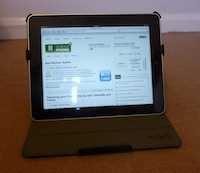 It’s a shame they couldn’t have provided something to clasp the iPad more in place when you’re using it like this. But then you would have to unclasp it again to angle it in landscape mode. In short, it’s my new iPad case, having supplanted Proporta’s recycled leather case. It looks slick, has a low profile, and has quite a business-like feel to it – not that I’m in any hurry to work in an office again! The case was kindly supplied for review by KJC Technologies.